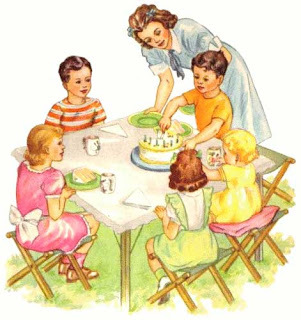 In our family, summer time is a full of birthday party celebrations. If your experiences are like mine, your children have attended some extravagant birthday parties that leave a heavy footprint on the Earth. Large blowup, bouncing jump rooms, corporate character disposable dinnerware, paper hats that don’t even last until the end of the party, dollar store junk for party favors, balloons and excessive decorations, etc. seem to be the norm in children’s birthday parties. For my children’s birthdays, I am always looking for ways to lighten our impact during these grand occasions, while giving them the special celebration they desire. Below are a few suggestions for lightening the impact of your child’s birthday celebration. 1. Use digital invites: By creating your own digital invitations, you can email them to your friends and family and reduce the amount of paper involved in the celebration. You may need to print a few invitations to mail for those families not connected to the web, but this will still lighten the impact. A homemade invite also becomes a keepsake to document the day, and you won’t be supporting the corporate characters targeted at children. You will also save time and money by creating your own digital birthday invitations. This goes for other people’s birthdays as well! 2. Pick a natural location for the party: By hosting your party in a natural location, such as a beach or park, you will be combating nature deficit disorder and eliminating the need for jumping rooms, extravagant decorations, etc. Every year, we have our party on a neighbor’s beach. The river provides the entertainment and increases our attendance of distant friends who look forward to a day of river fun in the mountain sun! Also, if the party is located away from your home, you are less likely to go overboard with party favors, decorations, etc., as you will have to pack it in and pack it out of the location. 3. Use reusable plates, napkins, utensils, cups, etc. : I am always amazed at how much garbage is created from even a small birthday party. By using reusable plates, utensils, etc., you are lightening your party’s impact greatly, as well as teaching your children an important lesson about disposables. The clean up after the party will be greater if you use reusables; however, the benefits to the planet certainly outweigh a little of your time. If you must use disposable products, look for paper products that are made with recycled, post-consumer materials and corn plastic utensils that are compostable. 4. Provide natural, eco-friendly party favors: One of the things I dread about my daughter attending her friends’ birthday parties is dollar store, plastic junk and candy she receives as party favors. If you feel compelled to give out party favors, look for items that will not be easily tossed into the landfill and won’t break within a day. Crystals, polished rocks, geodes, etc. make wonderful party favors children’s cherish, and these natural items will contribute to children dramatic play at home. Several natural toy stores also carry party favors. These toys may be more expensive, but when placed in the larger picture of sustainability and climate change, the cost is irrelevant. Better yet, forego the party favors altogether. 5. Serve a vegan, chocolate cake: Whether you make your own cake or buy one, think about the ingredients used in the cake and how you could improve this aspect of the birthday tradition. We are lucky to live near a bakery that makes the best vegan, chocolate cake filled with raspberry sauce. They will even make the cake with our own garden grown, organic raspberries. There are many great recipes available online for vegan cakes. 6. Make gifts optional: If your kids are like mine, they already have too many toys! The birthday party can be another contributor to this problem, and if you are like me and detest plastic toys, your child will inevitably receive annoying toys that you do not like. By making gifts optional, you will prevent families frohttp://www.blogger.com/img/gl.link.gifm feeling compelled to buy anything just to attend the party, and your child will not receive a gross amount of junk. Children already receive many gifts from their families, so eliminating a few toys from their friends will not impact the joy of their birthday. You could also request used toys and books or no gifts at all. There are many ways you can lighten the impact of your child’s birthday, as well as teach them a valuable lesson in sustainability, conservation, etc. You can still have themed birthday parties without all of the commercial products associated with them, by asking families to wear homemade costumes, make your own decorations, etc. Keep it simple, and everyone will enjoy the celebration more while doing a little bit to save the Earth from climate change. This post originally appeared on GNM Parents. « And the Winner Is….EcoMum! Thanks for all the tips. I’ll keep them in mind when I hold my girl’s birthday party, which I’m already thinking about even though it’s months away! We did all elmo, but next year I think a non commercialized version will be alot more fun. I did make her cake all organic. I had no idea you could make a vegan cake! Thanks for the tip. I thought i was the only one thinking like this (and I get the impression people think I am a holier than thou cheap-skate, rather than the eco- warrior! Love the ideas. Having a party on the beach in Ireland though would mean rain, even in summer! To convince my critics my idea will have to be foolproof! Thanks for the tips. But I make all the arrangement through ‘ShindigZ’ store of CouponAlbum site. I have been using a Kids Konserve Party Pak for parties, picnics, and classroom parties. No more paper products. The party pak includs 25 each: 7″plates, 16oz. tumblers, and forkds, knives & spoons. All items are reusable and dishwasher safe. All items fit into a very eco-cool cotton drawstring bag. The bags can also be purchased as party favor bags. It is so nice to not have the garbage can over flowing with paper products. The site is http://www.kidskonserve.com. For the party paks, email at reuse@kidskonserve.com. Hope this is helpful.